Good morning…have a feeling this will be the last blog for a couple of days as the weather is about to go into vacation mode..as are so many others out there who are going to try and take some days off before school re-starts in a couple of more weeks. We’ve enjoyed below average highs for 5 days in a row…and we’re going to add a few more to that before the more typical summer regime builds back into the region. A reminder that Mars will be closest to the earth Tuesday night…some 35.7 million miles away. Hopefully sky conditions cooperate. It will be the brighter, sort of reddish, planet shining brightly towards the right of the moon. 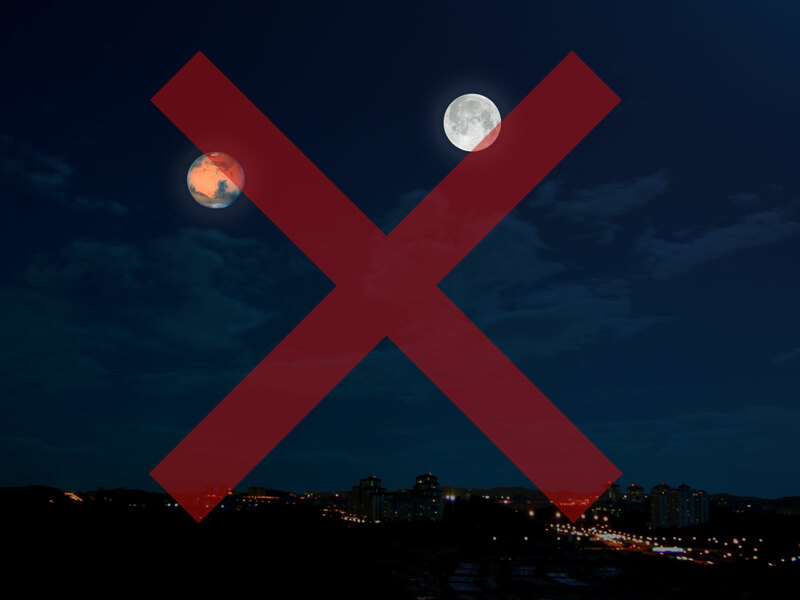 Mars is about half the size of the earth…it will be at it’s highest point in the southern sky towards midnight…and I believe it will be to the right of the almost full moon. There are some hoax #fakeplanet pics running around showing this to be a tremendously large (moon size) object in the sky…it won’t be and don’t fall for the stupidity. It will be like a bright star…a pinch bigger perhaps. The next close visit of Mars (not as close as Tuesday night) will be in October of 2020…it will be about 3 million miles farther away from earth than Tuesday night. Oh and IF you have a telescope it will look better but still not great. You may have heard about all the dust storms circulating around the planet…well that has obscured the surface features tremendously. Another way of viewing things is how the night sky will look tomorrow night…try this link. Did you know that since 1/1/2017(!) St Joseph is running more than 20″ below average for moisture. Remember how wet last summer was in the KC area? Well they missed a lot of the heavy flooding rains that we received here last summer. In KC…July is actually going to go down as a wetter than average month. We’re almost an inch above average…and there may be some spotty storms later today (Monday) in the region as well. The overwhelming signal though in the model data, as I’ve talked about for the last few days…is a pronounced warming trend that will take us back to and then back above average. The coolest will be Tuesday morning (50s) the hottest will probably be over the weekend (mid 90s possible). So our run of “nice” weather for the last week will be coming to an end (from a temperature standpoint, in a few more days. Our feature photo comes from Charley Caron down towards Garnett, KS…he did well with the rain yesterday. With all the talk of firewhirls lately I was wondering something( may be more of an academic thought), I know that most firewhirls are more related to dust devils in terms of how they are formed, so even though they can be as strong as tornadoes, they are not considered such, BUT since the NWS will classify land/water spouts as a tornado over land even though they form differently than “supercell tornadoes”, if a firewhirls updraft is connected to a “parent” pyrocumulus, by that convention, could it be classified as a “official tornado?” since it seems that the policy is to consider a vortex updraft that is connected to a “cloud” as eligible to be called a tornado, and on that isn’t as not( dust devil). IDK I just thought that was interesting since the weather has been slow here lately. Oh, thanks :) I had been thinking about it for awhile since on different media outlets they say that they are not true tornadoes because of the way they are formed, but then I thought about the landspout thing, tbh I don’t know if it would “help” anyone if someone did decide they “could” gain tornado status, but maybe there could be a third designation for large firewhirls, that an advisory or warning could then be given, i.e. “combustion cyclone” or ‘fire cyclone”?